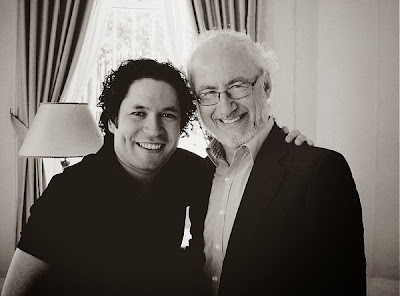 To celebrate Norman Lebrecht leading the charge against the "shamed" Gustavo Dudamel I am offering Overgrown Path readers the chance to win two exclusive prizes. One goes to the first reader to identify who that is in the photo up close and personal with Gustavo. Another is for the first correct answer to this question: which cultural commentator was invited to give the pre-concert talk in Los Angeles before the Dude's performance of Mahler's Third Symphony on January 24th 2012? Both lucky prize winners will receive a shredded copy of Lebrecht's Maestros, Masterpieces & Madness: The Secret Life and Shameful Death of the Classical Record Industry. Header photo was taken by BBC producer Paul Frankl and comes via Slipped Disc. I apologise for any possible transgression of copyright; but as Pau Casals asked rhetorically, does being an artist - even the mere author of On An Overgrown Path - exempt them from their obligations as a person? So, in this instance, mea culpa. As always, any copyrighted material on these pages is included as "fair use", for the purpose of study, review or critical analysis only, and will be reluctantly removed at the request of copyright owner(s). Also on Facebook and Twitter.